Published in New Testament Essays in Honor of Homer A. Kent, Jr., ed. Gary T. Meadors. Winona Lake, BMH, 1991, 143-63. There are few more beloved images from the Bible than that of Christ as our “God Shepherd.” God as or shepherd is a well-known biblical idea common to both testaments. After the NT period, this image of Christ remained popular with the church as it spread west through the gentile world. As it left its original Semitic setting, however, it is clear that the context of the image was quickly lost. While the shepherd image for Christ would be the most popular pictorial representation in the first four centuries, by the middle of the fifth century A.D., it had all but disappeared from the Church’s art. A modest exception to this observation might be made for certain branches of the church whose language was Syriac. As this study is begun, it is important to search of possible explanations for this startling change in imagery. 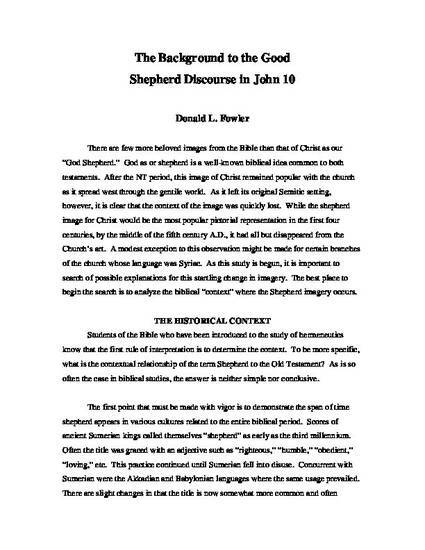 The best place to begin the search is to analyze the biblical “context” where the Shepherd imagery occurs.